What type of blankets work best? Blankets should be NEW or handmade. We appreciate, fleece, “no-sew” and store-bought blankets. Please no afghans, quilts or double layer fleece blankets. What does Like New mean? Like New means top quality and nice enough to give as a gift. What size should the blankets be? We ask people to imagine a young child toting a blanket. Ideally, blankets should be able to fit in our canvas tote bag which measures 15-1/2 x 15. (The ideal size is 45 x 60 but NO larger than 50 x 60 please). Do you accept used blankets? No. Blankets must be new. Do you accept used stuffed animals and books? Yes. Project Sleep Tight appreciates Like New books and stuffed animals. All donated items should be top quality (good enough for your own child). Books appropriate for ages 0 to pre-teen. Can the blankets and stuffed animals be handmade? Yes. Project Sleep Tight is happy to receive handmade items! There is nothing more special than items that was made with care especially for a child. The stuffed animals should be no larger than 15” in order to properly fit inside our tote bag. The ideal stuffed animals would be “snuggle size” or a minimum of 8″. Are there any other restrictions on animals/ books? No books or stuffed animals with battery compartments. No stuffed animals that make noises — such as singing, reciting prayers, etc. No religious, commemorative or holiday stuffed animals or books. No stuffed animals over 10 years old (no collections) for dust/sanitary reasons. We do NOT accept items that have been recalled, banned, or do not meet safety standards. How much should I spend on the contents of a Sleep Tight Tote? 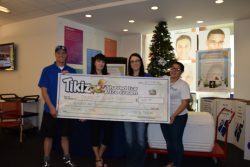 Does Project Sleep Tight need financial donations? Yes! We rely on financial donations to help us cover the ongoing costs of running a not-for-profit organization. Project Sleep Tight operates with very little overhead so that your donation goes directly to the homeless children we serve. Credit cards are accepted on the WEBSITE and checks may be made payable to “Project Sleep Tight”. Contact us for the mailing address. How do I obtain the tote bags? To participate in our Project Sleep Tight Program, please CONTACT us with your name, address, phone number and quantity of tote bags needed. Project Sleep Tight ships via Fedex Ground or United States Postal Service. The tote bags cost $1.00 each (which includes shipping costs). You may pay by credit card on the website, or we will include an invoice with payment instructions with your tote bags. Please make checks payable to “Project Sleep Tight”. Do I need to pay before receiving my tote bags? No, we will mail your invoice with your tote bags or you may pay on our WEBSITE. We accept checks made payable to “Project Sleep Tight” or credit cards and PayPal on our WEBSITE. Why do you charge for tote bags? 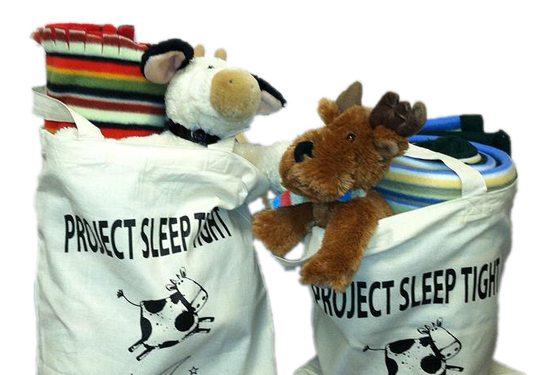 Project Sleep Tight requests a donation of $1.00 per bag to cover the cost of purchasing and shipping the tote bags to you. As a not-for-profit organization, Project Sleep Tight appreciates your contribution so that we can continue to provide our services to as many homeless children as possible. How do I find a shelter? Project Sleep Tight recommends visiting The Housing and Urban Development website (www.hud.gov) or using your local yellow pages to find a family or domestic violence shelter in your area. What do I say when I contact the shelter? When you call a shelter, ask to speak with the children’s coordinator or person in charge of donations. Please tell them that you have partnered with Project Sleep Tight and would like to donate X number of Project Sleep Tight Totes to the children in their care. 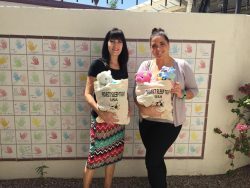 If this is a new shelter relationship, you may need to explain that each Project Sleep Tight Tote contains a new blanket, book, and stuffed animal for children ages 0-12. Kindly obtain a complete shelter address, contact name, and delivery hours to relay to Project Sleep Tight. Please send the information via the CONTACT form. Once I have delivered my Sleep Tight Packages, does the shelter receive ongoing support? Yes! Shelters are always welcome to request additional Sleep Tight Packages directly from Project Sleep Tight at any time. Can Project Sleep Tight find the shelter for me? If you are not comfortable finding a shelter, we are here to help. It is our recommendation that you speak with the shelter in order to assist in the coordination and delivery of your Project Sleep Tight totes. Do I need to call the shelter if I am selecting one from your list? Yes please. Project Sleep Tight has the pleasure of working with many volunteers each year. To avoid overlapping deliveries, we recommend that you contact the shelter in advance. This will help to determine the number of Project Sleep Tight totes that the shelter can accept, to coordinate delivery, and to decide if multiple delivery sites are necessary.